Home / Free Videos / GET OFF YOUR RIGHT SIDE!! GET OFF YOUR RIGHT SIDE!! 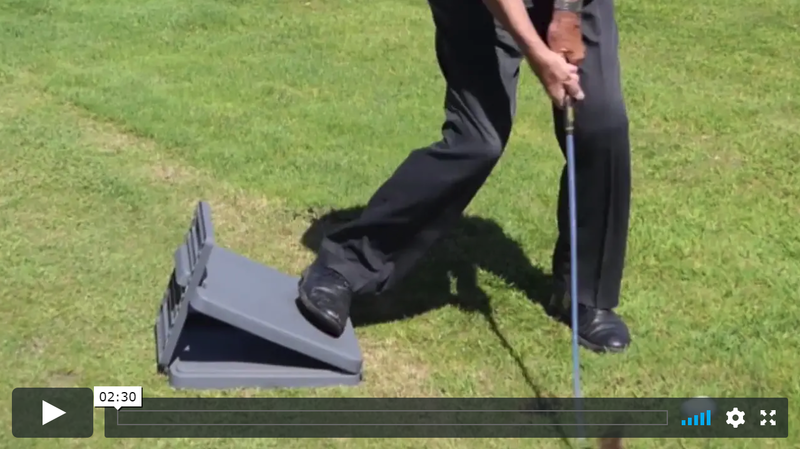 ALL great golfers make a great transition Off of their Back Foot and onto their Front Foot. In other words they all have excellent weight transfers, and with the majority of them, you’ll see their right heels off of the ground pretty early in the downswing. Although a few good players keep their Back Foot relatively flat on the downswing, the truth is that those that do still have the majority of weight going onto the lead foot. Getting ‘Stuck’ on the Back Foot can also create a tendency to Stand Up and Flip the Hands. When the Right heel is driving off of the ground, you’ll increase your chances of getting more Body Mass into your shots. A Great Drill to help you Feel the Weight Shift is to stand on a SLANT BOARD with your right foot (as shown in the photo and video above) and get the Feeling of what I call ‘The Surge of Power’ as you move down and into the ball. I also recommend that you take a short iron and actually practice hitting shots with your Right Foot on the Slant Board. You should find that not only will you feel the freedom of moving down into the shot, but you’ll probably notice that your hips will actually get into Flexion (Forward Bending), which will certainly help you Compress the ball.